During the presidential campaign, Donald Trump regularly blasted “sanctuary” cities by featuring family members of victims of crimes committed by undocumented immigrants in such cities. So it is no surprise that Trump’s immigration executive order directs federal agencies to withhold grant funding for sanctuary jurisdictions. This debate over crime and sanctuary policies is relatively new. These policies came under fire after the July 2015 death of Kate Steinle, who was shot and killed in San Francisco, allegedly by an undocumented immigrant and repeat felon who had been deported five times to Mexico. Before the shooting, San Francisco police had released him from custody after drug charges were dropped. Despite a request for notification of release, the Department of Homeland Security was left unaware. Trump likes to use stories like Steinle’s to assert that sanctuary policies are a public safety threat. But there is little research looking at the impact of sanctuary policies on crime. It’s a difficult correlation to study; many factors affect crime, and state and local law enforcement do not always track inmate citizenship status. Moreover, it’s unclear exactly how many sanctuary jurisdictions there are. Researchers identified somewhere between 165 and 608 local and state governments with sanctuary policies. And agencies vary in their approach. Some don’t cooperate at all, while others only do so in civil investigations, for felony convictions or for offenders otherwise deemed to be a public safety threat. University of California at San Diego professor Tom Wong looked at 608 sanctuary counties and found lower rates of crime in those counties than in non-sanctuary counties. His research was published in January by the progressive think tank Center for American Progress. Other studies showed that in some jurisdictions, immigrant-friendly policies led to a decrease in crime, PolitiFact found. Opponents maintain that sanctuary policies are a threat. The issue is not crime rates, but the release of criminal aliens who commit additional crimes, said Jessica Vaughan, director of policy studies at the Center for Immigration Studies, which advocates for lower levels of legal and illegal immigration. During an eight-month period in 2014, more than 8,100 “deportable aliens” (whose immigration detainers were declined by sanctuary jurisdictions) were released after arrest in 276 sanctuary jurisdictions, an ICE report shows. About 62 percent of the released offenders had a prior criminal history, and about 3,000 were felons, according to the report. Of the roughly 8,100 individuals released without being turned over to ICE, 73 percent (6,278) had no subsequent criminal arrest and 27 percent (2,414) were associated with a subsequent criminal arrest. However, in general, extensive research shows noncitizens are not more prone to criminality than U.S.-born citizens. The vast majority of unauthorized immigrants are not criminal aliens or aggravated felons. We covered this in depth here and here. Trump claims sanctuary cities “breed crime.” But there is limited research on the impact of sanctuary policies and crime. The research that does exist, including one study published by advocates of immigration, challenges Trump’s claim. These studies either found no statistically significant impact of sanctuary policies on crime, or a reduction in crime due to immigrant-friendly policing strategies. Sanctuary jurisdictions release inmates after their criminal case is complete, and extensive research shows noncitizens are not more prone to criminality than U.S.-born citizens. Moreover, some sanctuary jurisdictions do cooperate with the federal government if they believe the inmate is a public safety threat. It’s one thing to raise concerns about the impact of sanctuary policies, but Trump goes too far declaring that the cities “breed crime.” He not only makes a correlation, but also ascribes a causation, without facts to support either. 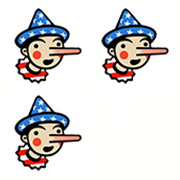 We award Three Pinocchios. Keep tabs on Trump’s promises with our Trump Promise Tracker.